These bench units incorporate the head of the 2010 & 2010T thermal system with a Blanchard ground, steel top machine stand. The 2010T Bench Unit unit has a digital timer. The manual, lever arm unit is ideal for large or small single/multi-point assembly operations. The machine head slides left or right on the gantry and can also be adjusted up or down. 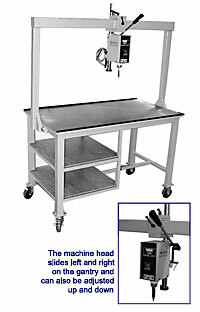 The spacious machine stand can accommodate large parts needing extended support. If a fixture is desired, it can be made of aluminum with a plastic pad, or roller ball bearings, to allow free movement for part location. Optional safety rails can be added to safeguard heavy fixtures from falling off the table. The table unit was originally designed as a repair station due to the variety it provides.